It's a poor quality video, but it is just a temporary recording to further our discussion. I simply sat my phone on the counter and recorded a few things related to using a micropipette to instill my eye drops. I used the micropipette for my actual eye drop instillation tonight and it worked well. I'll know tomorrow whether 10 uL is a sufficient drop size. The normal drop size is about 4 times that large. My initial guess from tonight's experience is that 10 uL will be enough. If it is not, I also have a 20 uL pipette. I'm still on the learning curve. I'm not ready to make any conclusions. But for a first test, I thought things went well tonight. Other FitEyes members are using the same brand but in the 20 uL size. I think this is a good choice. The fixed volume pipettes work great and they are very inexpensive. A few are using more expensive variable volume pipettes. I have not tried one myself, but I think they would be good for the more experimental among us. Thanks for clarifying, I agree that volume reduction is a compelling area to look at. Another thing that bugs me is that the 'standard' drop size is really too big for the eye to hold and usually a portion runs over, adding to the imprecision of dosing regimen. I think any of those variable 2-20uL pipettors are probably fine in the $50-100 range. When you pay $250, you're probably getting unnecessary precision you would only need for a PCR reaction (i.e. their intended use). I would just caution that the precision probably drops considerably when you go below 10uL. In my line of work, we desperately try to avoid pipetting volumes of <10uL since the variability is much higher as a % (unless you buy a very precise and expensive and calibrated pipette). But that said, using say, a 5uL dispense volume still might meet your objectives (i.e. low dosing) even if it was 'imprecise' by scientific standards (i.e. 30% variance). Another potential option is fixed-volume pipettes. These are really inexpensive yet rated for diagnostic use. $100 gets you the whole set, or you could just buy the 5,10,20uL versions for $18/ea. Something tells me this would have a better chance of being repeatable. Below is what I ordered. I only use the 10 uL size. But I think the 20 uL is more appropriate for most people and that is what I would recommend. Here's the promised report. Apologies for its length! Short version - I’m really glad I got a pipette for dispensing drops. Thank you so much for this suggestion! It’s enabling me to reduce the amount of medication that gets in my eyes and I’m finding it pretty easy to do. The Simply Touch dispenser hasn’t worked as well for me, at least for my purpose of using less of the drug (more below). I bought both the 10 & 20 uL (microliter) pipettes as I wasn’t sure what size I’d want. But I find that 10uL is a substantial drop, to me at least, so I’m not using the 20uL pipette. I’m now experimenting with extracting a drop smaller than 10uL so I’ll be interested to hear about the IOP results you get from smaller doses, Dave. My ophthalmologist once told me that just a smidgeon of a drop would do the job, so I’m hoping he’s right as I’m aiming for a small as possible (not worrying too much about total precision) but of course still want to have an effective dose. For anyone who’s thinking about trying this and like me wouldn’t know a pipette from a pipe-cleaner, do watch Dave’s video, which I didn’t until after I had reinvented the wheel. (I'll take the liberty of re-re-posting it -https://drive.google.com/file/d/0B3Q0gid8iYruRmtiVWZ6b2lteHM/edit?usp=sharing). Then you’ll know what a pipette & a pipette tip look like, at least. (The pipette is basically a syringe; you slip a tip on to it and that’s where the drop is held once sucked from the bottle.) Using them truly is straightforward once you’ve got the hang of it. I can imagine though that it might be difficult to do this if you have shaky or very weak hands, and using a pipette does make my drop routine a bit longer. As already mentioned in this discussion, the seller’s website is www.universalmedicalinc.com. I ordered the pipette brand also recommended earlier . The full search term is “Diamond Jr Pipettors – Single Channel Fixed Volume Pipettes – Fully autoclavable” or you can enter the SKU - GS 3322-10 (10uL) or GS 3322-20 (20uL). $18 each. I ended up ordering pipette tips that are not listed on the website but that can be found by entering their SKU into the search box – GS 151145. It’s a bag of a thousand non-sterile 0.5 – 20uL universal ultra-micro pipette tips (ie they fit on any pipette between 0.5 & 20uL – it’s the pipette more than the tip that determines the size of the drop). $20 for the bag. On the sterility issue – you can order a bag of sterile tips, but they’re only sterile within the bag, not individually, and they cost much more. Maybe I’m being too relaxed about it, but I figure the drop bottles aren’t sterile. I’m re-using the tip I use for xalatan, keeping it in a sealed container in the fridge. The tips for the more viscous drops like azopt & simbrinza are harder to re-use because they get gunked up & don’t wash out easily. I’m mostly just getting a couple of uses out of each of those tips, with the occasional bonus use or two if they wash clean. I don’t touch the tips to my eyes so I haven’t been wiping them off with alcohol etc. So far so good!? I was confounded at first by how to get the pipette tip in contact with the liquid in the bottle – as you can see from Dave’s video, it won’t fit through the hole in the top of the bottle. Luckily for me, my partner came along when I was scratching my head & suggested I turn the bottle upside down, so we came up with a solution different to Dave’s system of popping the top out of the bottle (I’m not sure that would work with the xalatan bottle – it seems rather firmly embedded). My way of doing it is more fiddly, but the bottles stay sealed. I push the pipette plunger down; press the pipette tip to the hole in the bottle spout; turn the whole thing upside down; pull the plunger back out; and voila the drop is in the tip and can be transported to your eye. It won’t trickle out till you press the plunger in again, to insert the drop into your eye. Again, this is sometimes a bit trickier with the thicker drops – sometimes I have to repeat to get the flow going – but really no big deal. I happen to find putting drops in my eye fairly easy – I do it in front of a mirror so I can see what I’m doing (albeit fuzzily) – and so have also found it easy to insert the drop directly from the pipette/tip.. I did try the Simply Touch dispenser. I had been interested in it mainly as a way of providing a “pause” between the bottle and my eye so that I could control the drop size somewhat. I found that this did work with the viscous drops – they cling to the little gizmo so that not all the drug gets in the eye (though of course there’s some waste that way). This might be helpful for someone who doesn’t want to mess around with pipettes. I found that more liquid drops like xalatan tended to run off as I tilted the dispenser towards my eye, so personally I wouldn’t use it with them, although maybe others have a better way of handling it. The dispenser is also very small – easy to lose and hard for some eg with arthritic hands to deal with, as some Amazon reviews complain. But I know some people on this list to find it helpful for getting drops into their eyes, so clearly different things work for different people. I’m still irritated that the drop manufacturers are designing their bottles so badly and forcing us to jump through hoops, spend more money & generate more plastic waste to find solutions ourselves. But I definitely wouldn’t be without my pipette now – so again, many thanks to all who came up with this idea. "I'm going to try the micropipette but it's not easy. How on earth can you hold down your eyelid, instill the drop, and do punctal occlusion? You need 3 hands!" I use the Ritch-Sussman Technique for instilling eyedrops. I hold the micropipette the same way the video describes holding the bottle of eye drops (with slight modifications, of course). One hand holds the micropipette and the knuckle of the finger holds down the eyelid very naturally. The other hand depresses the plunger on the micropipette. The whole procedure now takes me less time than it used to take when I used the bottles. However, there is a learning curve! Be safe if you try this! Make sure you don't injure your eye. Please refer to past FItEyes discussions of the SimplyTouch. I still haven't figured out how to install but once I get it I can practice with Similisan eye drops. I have considered using the tiny SimplyTouch that I bought, adding 20uL of Similisan and then 20uL of Xlantan. That would give me a drop that should install. And it would keep the micropipette away from my eye. If you expect a consistent size from from the Lumigan bottle, that might be a problem. All my research indicates that the drop size is expected to be about 40 uL. But we also know that the drop size coming from the bottle is not exact. I have heard the drops from a typical glaucoma bottle can be as large as 60 uL. I think the more typical size range is from 40 to 50 uL per drop. I have not tested this. I suspect we could purchase finely graduated volumetric cylinders in the appropriate volume range. I know 100 milliliter graduated cylinders are available. But what we would need is a 100 microliter cylinder. I have not personally seen those, but I'm not in the lab equipment business and I wouldn't know where to look without asking for advice. If you have had trouble using the micropipette, that's a different issue and one I can probably help you with. OK, I've ordered and received the 20 microliter micropipette and the tips. I did a little experiment. I had a bottle of Lumigan that had a little bit left in it so I found a smooth surface and dropped one dose of the medicine onto that surface. I took the bottle tip off the bottle and used the 20 microliter micropipette and dispensed one "drop" onto the same surface a few inches away. On initial inspection it did indeed look like a little less than half of the size of the drop created by the Lumigan dropper. I was satisfied until I tried to recreate it a second time. The second time they looked like the same size. I emptied out the rest of the Lumigan bottle, rinsed it and filled it with clean water and tried again. This third time the "drop" dispensed from the micropipette looked LARGER than the one from the Lumigan dropper. I must be doing something wrong. Any ideas how I can demonstrate that this does indeed work? Yes, I notice a small amount of liquid remains in the tip. There's no way to avoid that. For me, the liquid left in the tip is just a trace amount. I have not noticed that the drop sometimes falls in two chunks. I don't think I've ever had that problem. Regarding your comparative volume tests, keep in mind that the viscosity of water and the viscosity of Lumigan are significantly different. I suspect your experimental test of the drop volumes will give different results for each fluid. At 7 uL I do not seem to need to punctal occlude... and I keep my eyes open for a few moments without blinking. Last night I used the 20 microliter micropipette for my nighttime dosage of Lumigan and I can definitely say that it was less medicine. I barely had to do punctal occlusion at all because there wasn't much medicine overflowing to the corner of my eye at all. One thing that is curious is that the "drop" (I put it in quotes because with a micropipette it's not really a full drop, right?) seemed to come off the tip in two chunks. I noticed this when I was experimenting with water too. It doesn't happen all the time, just every 4th or 5th time the "drop" doesn't come off cleanly and there's a little left on the tip. In those cases I could shake the tip and make the rest come off but of course you can't do this when you're putting the medicine in your eye. I noticed there was a little bit of Lumigan left on the tip when I did it for real after the second eye. Theory: perhaps it is because there are air bubbles in the bottle? I dispose of the tip after each use (but I do use the same tip for both eyes). I bought 1000 tips for not much cost. I am careful with the tips - eg I keep those I'm using in a sealed jar in the fridge, don't touch the ends with my fingers, and avoid touching them to my eye - and so far (a few months in) so good - ie no infections or other problems. I figure the tips aren't sterile to start with, and neither are the medication bottles. Barry, I am using 7 uL each day. Of course, probably only 5-6 uL actually makes it into my eye (with some staying in the tip). I'm working about 84 hr per week. On this demanding work schedule, the 7 uL dose every night seems best. David, At the 7 uL dosage level are you still dosing something less than every day? Not to brag but I've gotten pretty good with the micropipette. 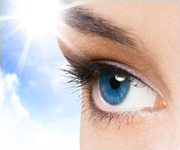 My eyes feel much more comfortable during the day with only instilling 20ul in each eye. Time to order a 15ul. The method I use is to just depress and release the plunger multiple times. The drop eventually falls. I appreciate the smaller drop size but I haven't had much luck with the 10uL size. The drop doesn't leave the pipette. Any suggestion? Thanks for your report Barry. See my response below. Barry: David- how do you manage to get 7uL of medicine in the tip and then how do you get it to fall off? I assume you are still using the 10uL micropipette? One could buy an adjustable pipette. (I may do that soon.) However, you assumed correctly. I am still using a 10 uL fixed pipette. Here is what I did. I used a sharpie permanent marker to put a series of spaced lines on the plunger. I started at the halfway point and assumed this line was about 5 uL. Then I drew the other equally spaced lines. I settled on 7uL because that is the smallest drop that I can get to fall from the tip without too much trouble. And it controls my IOP well. About 60% of the time the 7ul drop falls without any issue. The rest of the time I have to press and release the plunger multiple times (maybe 5 or 6) before it falls. That's not much trouble now that I am used to it. I completely agree with this! I hold my pipette carefully and I have never had a problem. But we should all be very cautious with this technique. Bob, we have discussed the exact details of using a micropipette in prior FitEyes discussions. I'll try to repost some of those discussions. In summary, I cut the top off the Zioptan vial so that the micropipette tip can reach all the way into the vial. I withdraw the intended amount of medication for one eye (e.g. 5 uL) with the pipette. I use the Ritch-Sussman Technique for instilling eyedrops. I depress the pipette plunger multiple times until the drop falls into my eye. I repeat for the other eye. Punctal occlusion seems almost unnecessary at less than 10 uL drop sizes.. I put the top on the Zioptan vial - I have worked out my own method for cutting the top off and being able to replace it. Then I enclose the medication (Zioptan vial) in a glass jar and put it in the refrig. I believe the plastic medication containers stored in a refrigerator lead to evaporation of contents! That method works very well with the pipette. I hold the pipette tip in the nearly same way advocated in the video. Regarding expiration dates, I completely ignore them. They are meaningless to me. I never throw medication away, even if it is past the expiration date. Be very, very careful when pointing a pipette tip at your eye! I am not advocating this to anyone. I am simply sharing what I do myself. I have never had an issue of any type when using a pipette, but I can see the potential danger. If I were an eye doctor, I probably would not feel safe recommending a pipette to my patients and I probably wouldn't recommend using expired eye drops either. But I'm not a doctor and I simply do what I do because it works for me. David: you are definitely onto something with using the pipette to better measure the dosage and conserve on the medication. I would be interested in how you do the whole process, e.g., whether you use one pipette to do both eyes, how you wash them, how you store the medication, whether you empty each bottle into a separate container when you start a new bottle, etc.. It must be a detailed set of intricate steps that would require somewhat of a learning curve to master. I can see that you could multiply a single bottle intended to last one month into lasting about 4 months, or more, and that is pretty amazing. As I have moved to smaller and smaller drop sizes, it has become increasingly difficult to get the small drop to fall off the end of the pipette into my eye. I recently made an important change in my pipette technique that has improved this situation greatly. Most of the time the droplet easily falls off the tip of the pipette into my eye on the first try with no difficulty now. The change I made is to withdraw the liquid into the pipette with a very slow and smooth motion. I release the plunger very slowly. Then I depress the plunger very slowly (as if in slow motion) to release the drop into my eye. If I do the motion slowly enough, even very small (e.g., 5 microliter) droplets fall off immediately. In the rare event that the drop does not fall off the tip, I repeatedly release the plunger (only in the range of the second stage) and then depress it again. Sometimes this has to be repeated many times before the droplet will fall. There are several methods for using a pipette. One is to withdraw the liquid using the first stage range only and release the droplet using the second stage range (the extra movement of the plunger). It is also possible to do the reverse: withdraw the liquid using the full range including the second stage (which will draw out more liquid), but then depress the plunger only to the end of the first stage range. I have tried these methods and a few other variations. I prefer the first (standard) method. Another recommendation is to withdraw and release several drops into the medication bottle (or vial) before doing it into one’s eye. This “wets” the inside of the pipette tip. I used to do this, but I now find it unnecessary with my “slow motion” technique. 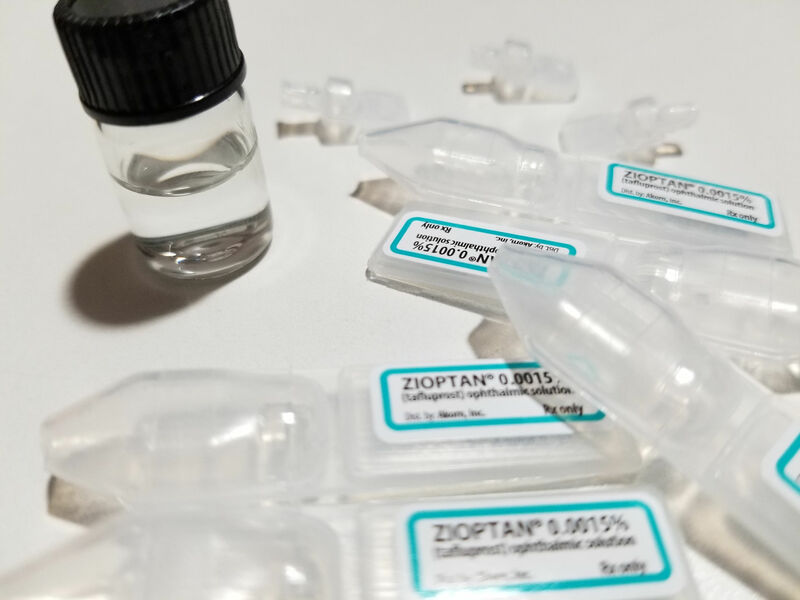 I use Zioptan which comes in single use vials. I have found that the plastic vials appear to allow the medication to become dehydrated in the refrigerator. Therefore, I now store my vials in a small glass jar with a metal lid that has a rubber seal. I can use a single vial for up to two weeks with no evaporation of the liquid. Furthermore, since my mediation lasts so much longer than expected (due to using a fractional size drop), when I open my foil packets, I put all the vials into a sealed glass jar. This helps them keep longer. Again, it appears that the plastic allows the medication to evaporate / dehydrate in the refrigerator, but putting it inside a well-sealed glass jar eliminates this issue. I speculate that the same would apply to plastic bottles. Therefore, for anyone wanting to use their refrigerated medication beyond 30 days, I think storing the bottle or vials inside a well-sealed glass jar is a good idea. As usual, for anyone using a pipette, be extremely careful. Using a pipette to instill eye drops could be very dangerous. I do not recommend it for anyone. I am only sharing my experiences for those who are brave enough and adventurous enough to want to try this on their own. That said, I’ve been doing it for a couple years without incident. But I frequently remind myself of the danger and I proceed with caution. FYI - on a somewhat related note: I've been using a 10 microliter micropipette and it looks like I'm going to get at least 6 to 7 months mileage from a 7.5ml bottle of Lumigan. And this after I spilled a little of the bottle, which is a hazard if you take the tip off. If I hadn't spilled it I could probably get 8 to 9 months from that one bottle. Wow! Yes, I've been using micropipettes thanks to fiteyes since 2015. I find even the tiniest amount of medication is still effective. I had a lot of problems tolerating simbrinza initially but using very small controlled amounts enables me to keep going with it, albeit with one rather red eye! This is a potential warning for those using a micropipette to apply their glaucoma drops. I started off with a 20 microliter micropipette and assuming all was well quickly moved to a 10 microliter model. I loved the idea of putting the absolute minimum quantity of meds not to mention the accompanying preservative into my eyes. 10 microliters is almost nothing, a mist. I experienced much less itching, dryness and irritation and at first the pressures seemed to maintain at steady levels as well. A win win all around. However, over several weeks I noticed that I was starting to experience a reoccurrence of white flashes in my left eye in the wee hours of the morning. This is something I shared about a year ago in a thread on that subject. The SLT procedure that I received 3 years ago had eliminated that phenomenon. Was it wearing off? I didn't observe a difference in IOP because taking a measurement at that time of the morning has always been difficult for me. Eye dryness and delay in getting to the machine messes up the reliability of the measurement. As an experiment, about 10 days ago now I upped my dose back to 20 microliters. Over a period of a couple of days the early morning white flash phenomenon has once again gone away. The lesson? Maybe when attempting to identify your minimum dose you need to drop down slowly and then when you think you've found it, raise it back up to the next level just before what you think is the ideal quantity. Another possibility: Perhaps there is some quantity of liquid that needs to be present for it to sit on your eye long enough for the meds to be absorbed. As I mentioned, 10 microliters is almost nothing at all. I don't know. All I know for certain is that 10 microliters seemed to be sufficient but it wasn't. 20 appears to be doing the trick. I'm sure it would be different for different people and maybe for different drops. I understand keeping the vials in the fridge in a glass jar is a good idea but how do you keep the opened vial from being contaminated, ie, touching the glass edges, etc? I decant the Zioptan from the single use container into one of the sterile vials, then a pipette to measure a drop into each eye, a new pipette tip for left and right eye application, then dispose of the tip. In this way I get multiple days from one single use container, using a new vial for every decantation. Standing the vial inside an upside down glass jar (stuck to the lid) keeps the vial vertical. Thanks for the clarification. I had a small glass vial - the kind used for essential oils - and I did the same thing for my first trial. I think I'll get more vials so I can have several on the go and being glass, I can sterilise them in boiling water for a new batch. Maybe it's a little more work but it means a second glass jar isn't necessary to stop evaporation and it'll be good for when I travel. My experiments have lead me to conclude that the shelf life of Zioptan can be extended by keeping the unopened foil packets inside a sealed glass jar (metal lid) in the refrigerator. However, it is certainly more important to keep the unopened vials from an opened foil packet inside a glass jar in the refrig. And finally, it definitely extends the number of drops I get from an opened vial when I store it properly. I'm going to start doing something like what Roger does. Keep in mind that I keep my Zioptan longer than is recommended because I use a much smaller drop each day. A "30 day supply" lasts me many months. Therefore, I notice the consequences of improper storage in ways that might not be obvious to someone who uses the vials from an opened packet within the recommended 30 days. However, there is no reason my observations should not apply even to shorter term storage. They may not be as important in that case, but these tips will help keep the vials fresher. Then I will withdraw each dose from that glass vial using my micropipette. As you said, this simplifies things and it seems to be an improvement over the single use plastic Zioptan vials, as well as an improvement over keeping the plastic vial inside a larger glass jar. Roger's careful approach is commendable. Once again, he has given me new ideas for upgrading my practices. For many years I have been reusing my pipette tips. I use the same one for both eyes and then I reuse it multiple days. I think Roger's approach is safer. It may be especially important if I fill my glass vial with 30 days worth of Zioptan. Inspired by our discussion, here's what I'm trying now. I emptied 5 Zioptan vials into a small glass vial. This will be enough Zioptan to last me more than a month. I am keeping this glass vial in the refrig. I use my micropipette to instill a small drop in each eye. The whole system is proving much easier and more convenient than my prior method. Kathleen, the way I sterilized my glass vials was to bake them in my oven at 400 degrees for an hour. Roger, what do you think about this approach? David, I think it will work well. However it might be better to decant just one Zioptan vial at a time. This approach would limit the number of times the pipette tip dips into the fluid, thereby reducing the risk of contamination. I get 10-12 days from one Zioptan vial @ 10ul per eye/day so 5 vials should last me approx 2 months. The micropipette is variable from 0.5 uL to 5.0 uL. I always leave it set on 5.0 uL however. It is a Thermo Finnpipette® FP Focus Pipette 0.5-5µl Adjustable Volume Pipettor. 5 uL is probably too small. In my experience, the ideal range pipette would be 5 to 20 uL. Or, if available, 5 to 40 uL. That would cover the full range most people would need. And I don't think most people would go below 10 uL drop size. Hi Fred, instead of taking out the dropper part, I turn the bottle upside down so that the liquid runs into the dropper neck from where it can be extracted with the pipette. I only have to remove the dropper part to get to the last few drops, which usually don't run into the dropper neck, & of course with micro-dosing that's not till a few months after starting a bottle. Each type of bottle has its quirks to be adapted to but I find this a very easy way to do it that enables one to keep the bottle sealed.